- The train to Central Station will cost € 4.60 p.p. A taxi from Central Station to your hotel will probably cost you between €15.00 and €20.00 per ride. Alternatively a tram from Central Station to the vicinity of your hotel will cost a minimum of € 2.70 p.p. and from there, you will have to walk. - The Hotel Shuttle from the airport costs € 15.00 per person, there is often a line and you might have to wait a while. - A taxi from the airport to the city center costs between € 40.00 and € 60.00 (max 4 passengers), without the service of Meeting and Assistance and you might have to wait for a taxi for a while. To Volendam: Take bus line 116 from the Central Station in Amsterdam. Duration: 30 minutes. Return ticket: € 7.00. 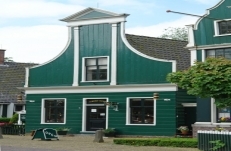 There is no public transportation between Zaanse Schans (windmills) and Volendam. From the Central Station in Amsterdam by train to Koog/ Zaandijk Station. From there it is a 20 minutes walk to the Zaanse Schans. Duration by train: 20 minutes. Return ticket: € 4.70 p.p. From Amsterdam Central Station to Den Haag Central Station it is a trip of about one hour by train. The cost for a return ticket is €19.10 p.p. Entrance fees: Panorama Mesdag: € 5.00 p.p. Madurodam: € 14.50 p.p. Take bus line 172 from the Central Station in Amsterdam. This bus leaves every 15 minutes. It takes about one hour to get to the flower exchange. Return ticket: € 7.00 p.p. Entrance fee: € 5.00 p.p. Make sure you leave no later then 07:30. after 09:30 the activity in the flower exchange dwindles or stops. If you really like to travel by public transportation then this is your day! You will need 2 or 3 different trains and a bus. You will be on the road most of the day. One way will take you at least 2.5 hours. Travel costs: € 42.00 p.p. You will have to go to the information stand at Amsterdam Central Station and ask for information for this journey. There you may catch a special bus line to the Keukenhof. (Nr. 58). A return ticket by bus is € 12.00 p.p. The entrance fee for the Keukenhof is € 14.00 p.p. Travel time from Amsterdam to the Keukenhof: about 90 minutes. Due to the popularity of this attraction and the short season, it might get very busy. Please add waiting time for your turn on the bus to your calculations.